Shed Racing competed in NASA's first points event for 2006, March 11-12 at Thunderhill Raceway Park, in the GTI Cup class. 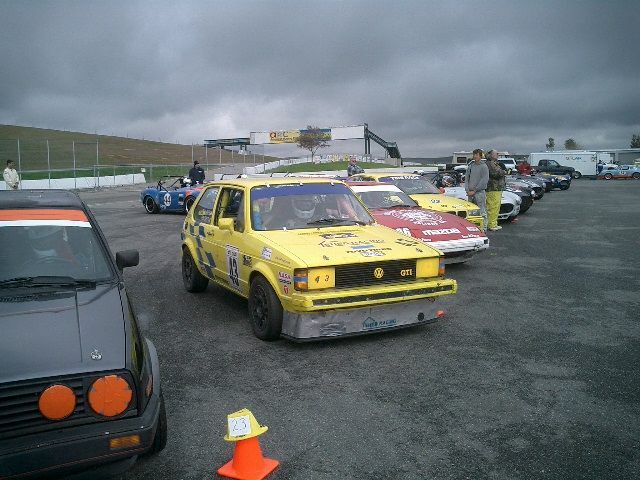 There were 3 cars in class this weekend, with Ron Swett driving Saturday, and Tom Sunday. The other competitors were Scott Neville, and Carlos Suarez. 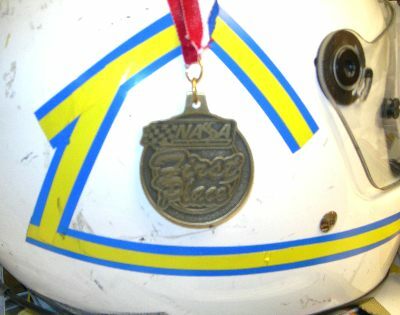 Just to keep things interesting, Tom also entered the NASA Time Trial series in the TTF class on Saturday. Ron and Tom got a late start leaving for the track, due to ugly weather, so they didn't arrive until 9:30 PM. Scott Neville had arrived earlier in the afternoon, and reserved the usual spot, close to the pre-grid, outhouses and electrical power. They immediately set to work getting organized, beating the front valance back into shape and installing it, and flipping the front tires on the wheels, to try and even the wear and extend their life. Halfway through the process, the Harbor Freight Tire Changer broke. The pin that holds the wheel in place, sheared, and the pry bar bent enough that it is too fragile to use. Some would say that it did what all tools purchased at Harbor Freight eventually do, it became a hammer. With no way to flip the remaining tire until AIM tire opened for business, Tom and Ron retired to the unheated RV to get some sleep. 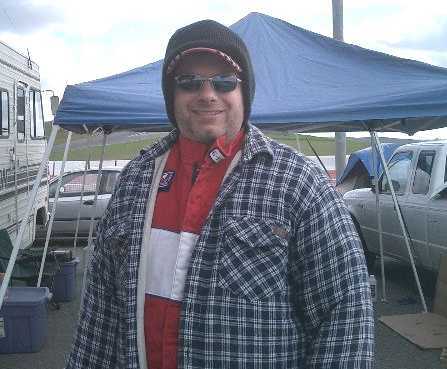 Miller Motorsports hanger-on and champion food moocher Bryan Crall and Angie arrived some time in the night. The alarm was set early, to finish prepping the car. The morning was cold, just over freezing, and thanks to the broken furnace in the RV, it wasn't much better inside. After coffee and breakfast, Tom and Ron did the last minute prep on the car, got it teched for the weekend. Tom headed down to the Driver's Education/Time Trial driver's meeting, while Ron got suited up for his morning warmup session. Bryan took the tire to the AIM garage to get flipped. 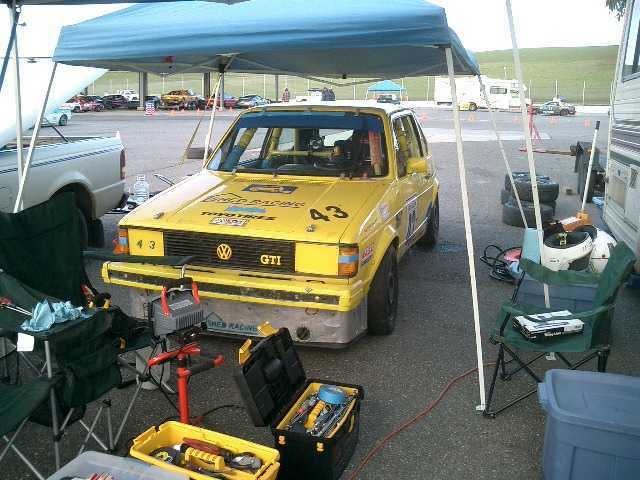 Carlos sold the car he raced last season, and built a new car on a newer Mk2 Golf GTI tub. The new car has a slightly more power, but weighs a little more. The suspension is similar, but it has a wider track, and is a little more aerodynamic. It should be interesting to see how the fast the newer car gets with some more development. Ron went out for the morning session, hoping to get a feel for the car after 4 months off. He only did 2 laps before coming in feeling the car was down on power. A quick check of the timing show it wasn't getting as much spark advance as it would like, so a quick adjustment and it was time for Tom to go out for the first time trial session of the day. Tom didn't notice a lack of power, so the timing adjustment must have fixed the problem. Morning times were slow for everyone, the track was cold and traffic was heavy. The next item on the schedule was Tom for the second Time Trial session of the day. With a warming track giving a little more grip, and a break in traffic late in the session, Tom managed a fast lap of 2:17.468, a personal best, and setting a lap record for the Time Trial F class. This doesn't mean much, as the GTI Cup class record is nearly four seconds faster, 2:13.567 for Thunderhill, held by Ron in the same car. Ron's race group went out to qualify just after lunch, and times continued to drop as the track got warmer. Scott and Ron traded fast laps through the session, with Scott setting his fastest lap halfway through the session with a solid 2:16.46. Ron put down his fastest time in the last lap of the session, with a 2:16.03, earning pole position. Carlos was a little slower, as he learned his new car, with a 2:20.5. Marcus and Scott from Miller Motorsports arrived mid morning and started to prep their Pro 7 Mazda for the Sunday afternoon endurance race. Tom was up next for the third Time Trial session. With traffic always a problem in the HPDE run groups, his best time was slower than the previous session, slipping to 2:18.6, his only lap of six under the 2:20 mark. 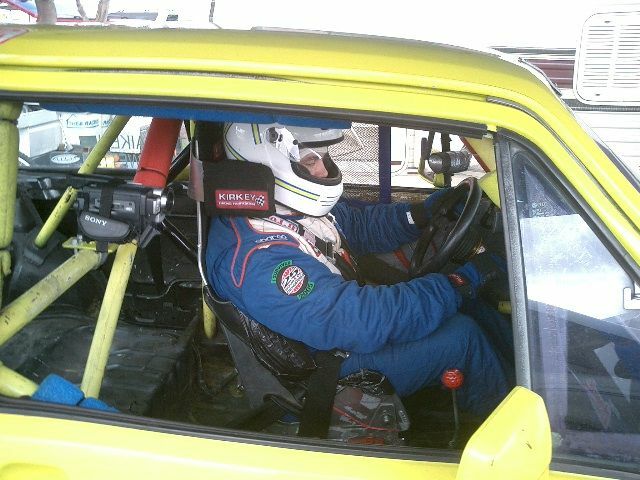 The car was running well though, and was checked over and refueled before the next item on the schedule, Ron's race. Ron and Scott lined up about ten car lengths behind the Pro-7 and PT cars, hoping to have lots of room to avoid any mishaps in the start, and hopefully to keep from getting spread out in traffic. Once the green flag flew, a mid pack RX-7 apparently missed the meeting where it was mentioned the green=go, and caused all the cars behind him to bunch up, and one to veer off into the infield to avoid the logjam. Scott made it through the turn one first, followed by Ron and Carlos, but the 10 car length space to keep clear of traffic was gone. Scott opened up a small lead, while Ron and Carlos traded positions while they worked the traffic. This went on until the SU field caught up, mid way through the second lap, when a BMW made a really stupid pass attempt on Carlos as he turned in to the extremely fast uphill turn 8. Carlos went to turn in, and found the BMW right where he needed to be to make the corner. Realizing he had no chance at making the corner, Carlos made the quick decision to drive off the track straight, and headed up the hill in the grass at ~80 MPH. Meanwhile the genius in the BMW nearly spun from entering the turn way too fast, and off line, leaving a pair of skid marks from his rear tires as the back of his car tried to lead the way. Amazingly he managed to save it and not wreck anyone else in the process. Carlos's car seemed undamaged, but had a bad vibration from mud picked up by the tires. At this point, Scott was too far ahead, and Carlos too far behind for there to be any change in the running order. 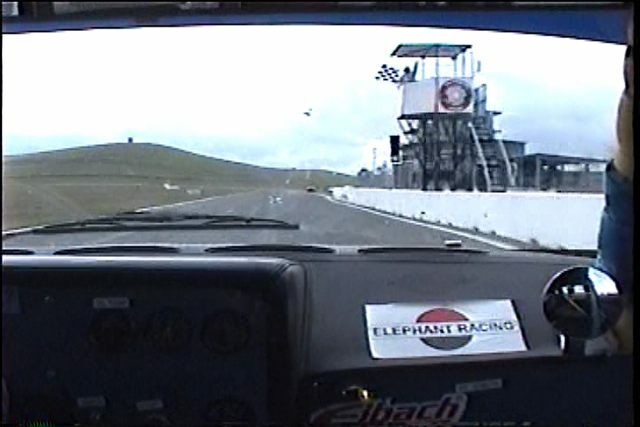 Near the end of the race, a rookie driven PT class Mazda RX-7 spun in front of Ron just after the Turn 5 bypass, forcing Ron to drive through the infield to avoid crashing. Scott finished first, followed 22 seconds later by Ron, and Carlos 26 seconds behind Ron. Best lap of the race was Scott, with a 2:15.4, followed by Ron with a 2:16.5 and Carlos with a 2:19.1. Unfortunately the video camera was left on after Tom's third session, and the tape ran out 1/3 of the way through the race. 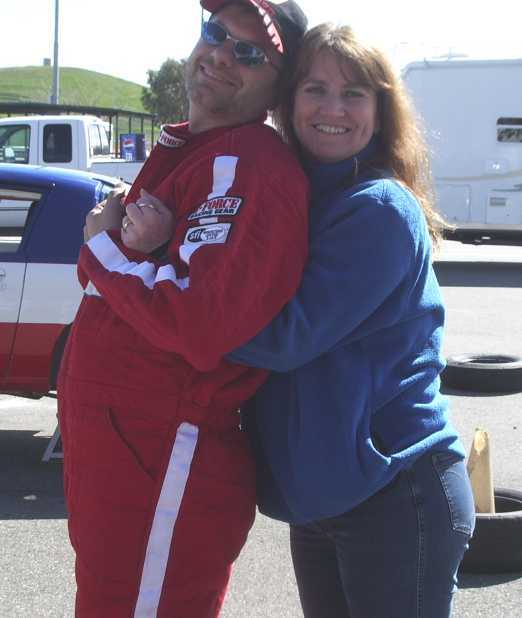 Ron and Cindy Celebrate not crashing. The last session of the day was the final Time Trial session. For the first 3 sessions of the day, the Time Trial group is combined with the HPDE group 4. The final session is split, with the drivers lined up on the grid by their best lap times of the earlier sessions. With less than half the number of cars on the track as the earlier sessions, and arranged by lap times, traffic is not a concern, allowing some fast laps. The session was excellent, with no traffic to speak of, and what Tom thought were good solid laps. Unfortunately the Timing system went offline at the beginning of the session, and was not operating again until the very end, and none of Tom's laps were timed. With the video camera out of tape, there is no way to get the times for what were certainly Tom's best laps of the day. Sunday morning was warmer, but with an ugly overcast and rain predicted. The morning warmup session combined the normal GTI run group with the Legends/ Baby Grand/Thunder Roadster cars and the teams entered in the afternoon endurance race, for a total of 74 cars crowding the 3 mile track. The track was cold, and traffic was heavy, and sprinkles started appearing on the windshield near the end of the session. Times were fairly slow, with Scott setting the fastest practice time of 2:18.7, followed by Tom (2:20.0) and Carlos (2:23.8). Tom and Marcus Miller had a little gentleman's wager about who would have the fastest lap in the morning practice session, which Marcus won easily with a 2:18.5. Learned something new about the Miller Motorsports guys this weekend. Soon after the morning warmup the rain arrived, sending everyone scrambling to install treaded tires before the qualifying session. By the time the qualifying started, the rain had slowed to a light sprinkle, but the track was soaked. The qualifying session was very entertaining, with Miatas and Factory Five Cobra replicas spinning off the wet track. Treaded tires and front wheel drive is the great equalizer in the wet, with all three GTIs out qualifying most of the faster cars on the track. 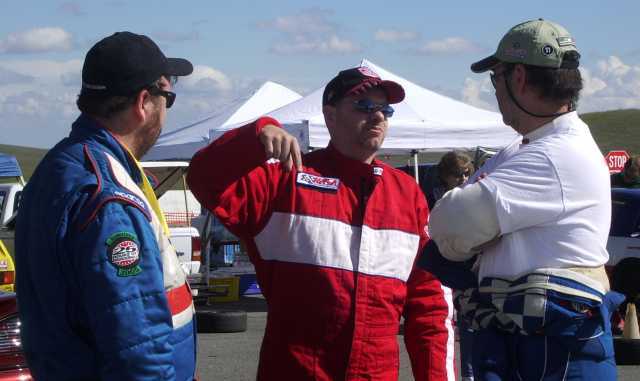 They were faster than 6 of the 7 Cobras, 12 of the 17 Spec Miatas, and 4 of the 5 Pro-7s entered. When the checkered flag came out at the end of the session, Scott Neville had pole position with 2:38.0, followed by Carlos with a 2:39.9 and Tom with a 2:40.2. The rain had stopped halfway through the qualifying session. The track was still wet, but slowly drying, and the thick overcast threatened to bring more rain to the track at any moment, and rain could be seen falling just to the north. A decision needed to be made whether to switch to dry tires. Tom and Ron discussed it, and they decided to keep an eye on conditions, and be ready to make the change just before the race start if it looked like it would stay dry. Ron checked the air in a pair of front tires, and had them in position if the decision was made. The weather wasn't improving, but it wasn't getting worse either, so with about 15 minutes before the scheduled race start, Tom rolled the dice and said "Change them". If the weather held, it would be an advantage, but if it started raining, or the track wasn't as dry as it looked, it would be a big disadvantage. Ron swapped the front tires with a pair of well worn, near slick tires, and Tom strapped on the car and headed to the grid. On the grid. Will it rain? The grid sheet for the Group A race showed 3 staggered starts instead of the usual 2, with the Honda Challenge cars taking the green first with a standing start, followed by the Pro-7, Performance Touring and GTI Cup classes with a flying start. The last group was to be the Super Unlimited cars and Factory Five cobras, also with a flying start. That was the plan anyway. Reality was different, as the front cars of the second group closed up too much on the first group, so instead of the planned flying start, most of the field lined up on the front straight to take the green flag from a dead stop. The start was confused, but clean with Scott leading into the first turn, followed by Carlos and Tom. This order held for most of the first lap, when Tom got a good run coming out of the esses and passed Carlos on the back straight. The next 2 laps, the three GTIs were nose to tail, with Tom trying to put pressure on Scott, and Carlos right on Tom's back bumper. Coming out of the esses near the end of the third lap, Scott had some trouble getting his car to shift out of third gear, and the momentary loss of momentum allowed Tom to get by to take the lead. Scott got the car into 4th gear before Carlos got by, and the close race continued for another lap, when Scott's transmission again stuck in third gear, this time it wouldn't come out, and Carlos made the pass. With the car stuck in third, Scott was forced to retire, and made the turn into the pits at the end of lap four. Carlos continued to put pressure on Tom for the next 4 laps, when Tom lifted slightly for a local yellow flag going up the hill, and Carlos made an accidental illegal pass. 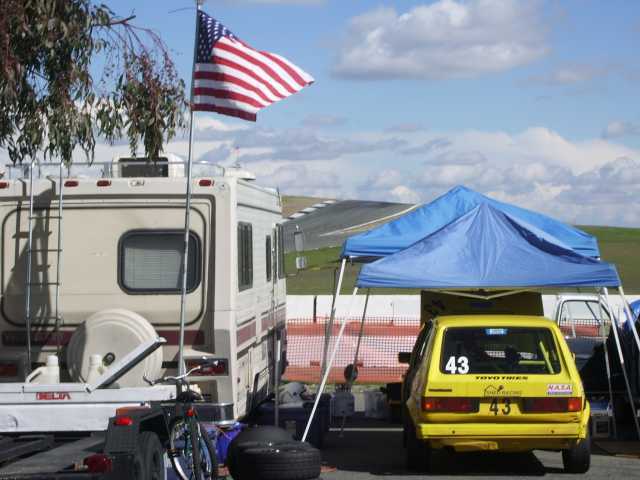 The yellow flag was caused by the same BMW driver who ran Carlos off the road Saturday, colliding with a Honda Challenge car going over the hill in Turn 9. When Carlos realized his mistake, he let Tom back in front, where the chase continued. With dry tires in front and rains in back, the car was twitchy, and a hand full in the fast corners. Even with tires less suited to the conditions, Carlos was a little faster through the corners, but Tom was faster on the straights. Tom held on to the lead for the next 4 laps to take the checkered flag and his first win 1.646 seconds ahead of Carlos in second place. Scott Neville, Tom Aiken, and Carlos Suarez on the podium. Tom set the fast lap of the race, with a 2:19.421, followed by Carlos with a 2:19.493 and Scott with a 2:20.427 before he retired. Aside from the crappy weather, which worked to our advantage thanks to the gamble on the tire change, it was an excellent weekend. 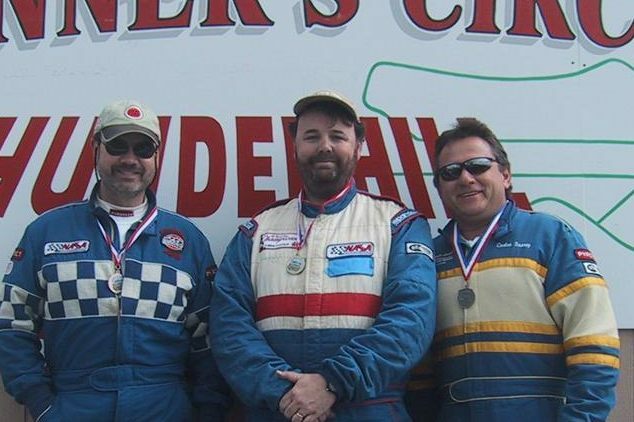 Ron earned his first pole position, and Tom won his first race, and also set the record for the Time Trial F class. 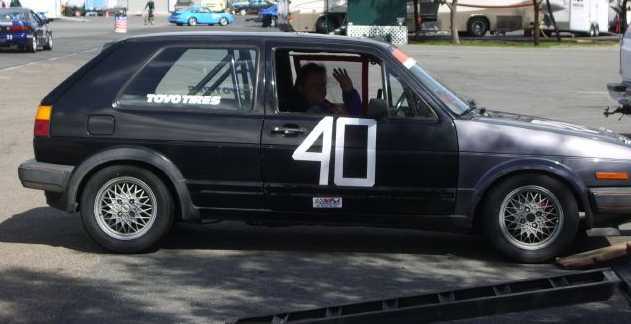 Apologies to future GTI cup racer Steve Fuss, the previous record holder. Another great weekend.